‘Twas the flight before Christmas…. It’s a busy travel season at the airports and you are soon to become one of the statistical “holiday travelers” about to embark on a journey along with tens of thousands of others. Coupled with some weather issues that are having residual effects across the country, you’re stressed about getting to where you want to be in a timely fashion. And…that’s certainly not how you want to define your much needed vacation. What can you do to improve your chances of getting where you want to be while minimizing the plethora of interruptions that are ever present? The answer is; a lot! Just follow a few simple rules and you increase your chance of jetsetting without too much a-do. 1. You should plan on longer lines than normal at check-in and security, and you should anticipate the real possibility of delays. By erring on the side of caution and getting to the airport early, you minimize your chances of a long line causing you to miss your flight (many airports no longer allowing a skipping of the line even if your flight is schedule to depart in just a few minutes) and you increase your chances of securing your seat on the flight (if the flight is “oversold”, the first people to get bumped are the travelers who check in last). 2. Travel insurance is relatively small expense to protect the valuable asset of your vacation, and it’s a wise choice on so many fronts. In addition to protecting the value of your personal belongings and your own well-being on the trip, insurance will provide you with travel assistance and reimbursement of additional expenses you might incur due to delay, cancellation or even losing of luggage. Airlines are not required to compensate travelers if delays occur due to weather, so without a travel insurance plan you would be on your own should you need to overnight somewhere, or if you missed the ship. 3. Map out a Plan B. Figure out your next best flight options in case your plane is delayed or canceled. A simple online search at sites like kayak.com will give you a quick snapshot of available flights. That way you can suggest alternatives that you prefer rather than end up at the mercy of a frazzled booking agent. 4. Load up your cellphone with some new phone numbers. In addition to the airline reservation line, include the number of your frequent flyer program if you’re a member. These agents tend to have more experience in looking for creative itineraries at the last minute and may be more helpful than that hard-to-understand agent from the Phillipines. If you booked through a third-party travel site like Orbitz or Expedia, their customer service department may be able to advocate on your behalf. 5. Pack smart. Those with carry-ons are more likely to booked on alternate flights since there’s no need for the airlines to worry about transferring checked luggage. If you do check luggage and a change to your flight occurs, your chance of having the luggage show up with you is significantly decreased. Not to mention…most airlines are charging up to $35 for a bag to check. Save a few bucks and a lot of headaches and carry on if at all possible. Do you really need that specialty shower gel or three sets of heels for a weekend at Grandma’s? 6. Know your rights. Travelers can receive up to $400 if they are involuntarily (or voluntarily) bumped and rebooked on another flight within 2 hours of a domestic and 4 hours of an international flight. They are elibible for up to $800 if they are not re-routed by then. 7. Be polite. Coutesy definitely gets more results than pushiness. Agents are people too and although they may sometimes appear to be ominpotent, stand-off-ish or regimented, they have feelings just like you. You can draw more bees to honey…. Applicable all the time, but especially during the busy holiday travel season, our best advice is summed up as: a little bit of advanced preparation may mean some down time at an airport, but an ON time arrival and the vacation you have been waiting for. Happy trails (and holidays) to you…..
AJ’s own Michele Rosenberg was recently one of the first passengers ever to expierence this amazingly new innovation in the cruise industry, called Oasis of the Seas. “Oasis of the Seas” brings a whole new meaning to amazing! Amazing Journeys was invited to be one of the first to see the newest member of the Royal Caribbean fleet. On the pre-inaugural sailing of “Oasis of the Seas” I was one of the first to see and experience this marvelous vessel. I had the honor and privilege to have two amazing days on the most innovative ship on the seas to date. The technology on board is phenomenal and makes cruising easy for everyone. You have the capability to search for venues and things to do with the state-of-the art equipment on each deck. A touch-screen board helps you find exactly what you are looking for and even shows you how to get there. It will even map out the easiest way to get to your cabin! There are also information boards that list each dining venue and what the current capacity is so you know if there is a wait at any given restaurant. It is difficult to put into words the awe one feels the moment you walk on board. She is truly magnificent in every aspect of the word. Oasis of the Seas is the biggest cruise ship in the world at 225,000 tons with a 5400-passenger capacity. This ship has more cabins than the average Las Vegas hotel has rooms if you can believe it. Options are endless both in entertainment and dining. It was not easy taking it all in but believe me when I say I gave it my all. Seven neighborhoods on 16 decks and one will never get bored. Royal Promenade – The Rising Tide Bar located on this “indoor street” transports guest between three decks while you enjoy a martini of your choice. Only one of many options with great selections of shops, pubs and restaurants. Not to mention a cupcake shop, which is a true highlight for any sweet tooth. Boardwalk – Truly reminiscent of the Atlantic City Boardwalk, you can become a kid again as you ride on a carousel, the world’s first onboard any ship, or take in a show at the one-of-a-kind Aqua Theater that is sure to wow you! Central Park – A tranquil gathering place where you can enjoy gourmet dishes in one of the many restaurants as you look outside to the trees blowing in the breeze. You can even dine al fresco! Central Park features serene pathways guiding you to boutiques and more. Pools & Sports Zone – One deck dedicated to offering you multiple pools, two rock climbing walls, two surf simulators, full-size basketballs court, miniature golf, ping-pong, and a beautiful and relaxing solarium. Vitality at sea Spa and Fitness – If you are in need of R&R, this state-of-the-art therapeutic setting is the perfect place for you. This spa offers the latest fitness equipment with the most advanced spa therapies. And.. this neighborhood is no different then the others, as it to has a dining option at the entrance offering healthy dining options. Entertainment Place – Enjoy the Broadway show, Hairspray or take in a comedy show. There is no shortage with the diverse venues both with grand and intimate performances – more to choose then ever before! Youth Zone – A dedicated space for age-appropriate groups where kids can be kids monitored by a caring staff. Although this may sound too large to even comprehend, how so much fun can fit onto any floating vessel, the layout provides a good old intimate feel that many will relish. As we say on any of our amazing travel opportunities and this ship is no different, ‘you are free to do as much or as little as you wish’. I can tell you every day on Oasis will be amazing! *Don’t wait until the last minute. Time to help plan is beneficial for both the traveler and the professional. It allows all arrangements to be made in due time without risk of rushing to cause any of the particulars falling through a crack. It also guarantees availability. Waiting for a last minute “fire sale” could ulitmately cause you to pay more. *Explain specifically what interests you. A good travel professional will take a few minutes to help you decide the best trip for you based on your interests, time of year you want to travel, budget and duration. Have a good honest chat. *Know that timing is everything. Some experiences are available only at certain times o fhte year and others are improved by careful planning. For instance, Costa Rica is an exciting destination year round, but by traveling there between June and December could mean more rain. Or, travel to Scotland is wonderful year round, but in September, you’ll have the added bonus of seeing the Scottish Hills all purple with heather. *Trust the experts. Try not to present your planner with requests or queries based on the advice of friends or family members who may have had a single experience in a locale. You are paying a premium for inside information, so take advantage of it! *Everything is subject to change. The world of travel is an imperfect science and its these unplanned events that ultimately make the most unique memories. Don’t just expect the unexpected. HOPE for it! *Be respectful of other people and their cultures. The way of life in another country is likely very different to yours and isnt’ that part of the reason you went away in the first place? To try something new! When you go away, don’t expect the same comforts, tastes, habits, personalities, driving skills, restaurant service, hotel amenities, greetings, scheduling or even toilets as you have at home. You went on vacation to “get away from it all” … so enjoy all the strange and wonderful experiences that will fill your life while on, what I like to call “VACATEshun”. Join Amazing Journeys in April and treat yourself to a vacation that can change your life. Get Very Much for Very Little…in Vegas! They say that what happens in Vegas stays in Vegas. But my good news from Vegas, also known for good reason as the City of Lost Wages, needs to be shared. You can enjoy entertainment right on the Strip that will leave your wallet intact and you with some fun memories of your trip. Our group arrived in Las Vegas late on a recent Wednesday afternoon, the last stop on a tour of some stunning Southwestern natural wonders. These included Monument Valley in Northern Arizona and Zion National Park, just across the border in Utah. The serenity that had filled my soul while taking in nature’s artistry was shattered when we pulled in to our hotel on the Strip. Just outside, there were wall to wall people everywhere, hawkers selling everything from hotdogs to hot babes and huge billboards advertising a myriad of shows: Cirque du Soleil, Bette Midler and Seinfeld (coming in December) to name but a few. Most shows had prices that made Tucson theatre look like bargain matinees. I was practically the only one in our group who didn’t shell out big bucks to be part of an audience that can number in the thousands. Call it serendipity, but I happened upon some great free entertainment right in the area. Upon entering my hotel room, I saw a phone message blinking from the management. The reigning Miss Universe, Stefania Hernandez of Venezuela, would be signing autographs in the lounge between 10:00 and 11:00 the following morning. I was there by 9:55. Finally about 10:10 Stefania appeared, statuesque in her stilettos, wearing her banner. She is a beautiful girl, with huge eyes and dark, shiny hair graced with a widow’s peak. It later occurred to me that there are many, many beautiful, poised, talented young women in the world. How many, though, are willing to go through all the rigors of numerous beauty pageants to arrive at the top? For that alone, Miss Universe is to be congratulated. A half hour or so later, our tour leader took us on what he dubbed “Bill’s Excellent Walking Tour of the Strip.” I had been to Vegas once before and had been mesmerized by the dancing fountains in front of the Bellagio Hotel, the Luxor pyramid and replicas of The Eiffel Tower, Arch of Triumph and huge hot air balloon (the French Mongolfier brothers launched the first manned hot air balloon) outside the Paris Las Vegas. But instinct told me there was much more to discover that wouldn’t cost me a dime. In that, I was not disappointed. One of these discoveries was the magnificent glass sculpture of multicolored flowers hanging from the ceiling of the Bellagio Hotel’s lobby. It was created by the artist Dale Chihuly, with over 2000 hand blown glass elements. Although Chihuly lost an eye in a car accident during the 70s, his fertile imagination knows no bounds.. I stood under the sculpture in silence, awed by Chihuly’s creative spirit and determination to persevere. Our walking tour wound up at The Venetian, an Italian themed hotel. I was impressed by the statues in white robes , but then, Oh Mio Dio, I saw their eyes moving! Indeed, these statues were very much alive. I had a lot of fun asking my favorite “statue” a few questions which he answered by blinking his eyes. We just happened to walk onto a re-creation of Saint Mark’s Square during a free performance. A charming singer with an operatic soprano voice, jugglers and an acrobat all had their parts to play in this Venetian carnival. I was so captivated that long after the other members of my tour group had left, I hung out at the hotel to see the next show. It was even longer than the first, with the addition of musicians and other singers. The whole ensemble had such a contagious energy that I started clapping and even added my own nondescript singing voice to the chorus of a familiar number. I left the Venetian with an Italian song in my heart. Friday, we all departed for home. I took a later flight than most in the group, as a visit to the Liberace Museum was a must see. I had never forgotten Liberace’s dazzling smile, sweet personality and great technical ability. There was a short taxi ride involved, but tickets were modestly priced. Two for One coupons can be obtained in many venues, including hotels and racks throughout the city. The Museum was one of the highlights of my trip. Liberace’s flamboyant costumes (weighing up to 200+ pounds) were all there, along with his collection of flashy cars, even his shoes. A video was available to watch for $4.00 that featured footage of the star, known as Mr. Showmanship, in interviews. I loved that video and will never forget Liberace’s words: “I would like to be remembered as a kind and gentle soul, and as someone who made the world a little better place to live in because I had lived in it.” In that desire, he succeeded on a scale as grand as himself. Waiting for my flight home at the Vegas airport, I felt pleased to have gotten so much for so little. But suddenly from the corner of my eye, I caught sight of the nearby slots. Lured over and sucked in, I blew almost all the money I had saved on theatre tickets…and lost. Well, that’s Vegas for you! Traveling isn’t spooky. Just sometimes weird! Anyone who works in the travel world will tell you that while the pleasures of seeing the world trump almost anything that tries to stand in the way of another lifetime experience, there are some crazy things happening out there. Heck, there are some crazy people doing and sayingcrazy things out there. When “Great Hotels of the World (GHOW)”, an alliance of the world’s finest luxury hotels and resorts, posted a list of strange guest requests, we here at Amazing Journeys nodded our heads and smirked in total undeniability of the head scratching scenarios we choose to lend our hand with almost every day. I was curious about the best of their funny hotel requests, so I dug a little deeper. 1. Can you ‘turn down’ the ocean? The crashing waves at Gran Hotel Elba Estepona & Thalasso Spa irritated a guest so much, he asked the hotel staff if there was anything they could do about it. There wasn’t. d-uh! Brings a whole new meaning to “the poop deck”! 3. How much for the bed? At Shanghai Mansion, a pair of guests liked their bed so much, they requested to have the whole thing—including the silk pillows—boxed up and sent to Europe. 4. Can you cut the feet off my bed? At Hotel Puente Romano, a VIP guest felt his bed was altogether too high and wanted it lowered. The staff wasn’t having any of this, thank goodness. 6. The last time I visited this island it was very sunny and pleasant – not like this. I’m not going to travel with your group any more. My last group had much better weather. 7. You mean the ship doesn’t pick me up in Kansas? 9. From a Californian – Should I get some money exchanged before I leave for Alaska? And, what an amazing journey it was! From Arizona to Utah to Nevada, this terrific group of travelers relished in some of the most incredible weather, scenery and friendships during our 1200 mile journey from Scottsdale to Sedona, Lake Powell, Las Vegas and of course the highlights of The Grand Canyon, Zion and Bryce Canyon National Parks. Home again…naturally. But not for long, for Amazing Journeys as we look ahead to many more adventures in 2010. In the meantime, thanks to a wonderful group of friendly travelers who filled this journey with many memories and friendships. Below are answers to the most recent blog’s test of your knowledge of this region. How well did you do? 1. Which National Park isn’t really a Canyon? 3. Fact: The geological story of the three National Parks we are visiting are actually chronologically related. Records within the past 2 billion years reveal that geologic development of each park began when that of the other park ended. Which is the correct order of “oldest” to “youngest”? 4. Which of the following is a current threat to the preservation of the Grand Canyon? 5. Fact: The majority of Zion National Park’s visitors come during the spring and fall seasons with the months of December thru March being more offseason. Total annual visitation in 1920 was less than 4,000. Approximately how many people visit the Park annually today? 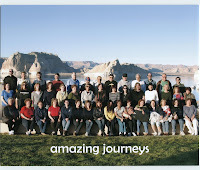 Amazing Journeys embarks on a journey this week to some of the most spectacular sights in America. We’re heading to a region laden with a rich history, dramatic landscapes and the truest of adventures as we visit the National Parks of the Southwest; The Grand Canyon, Bryce Canyon and Zion National Park. We begin in Scottsdale and will enjoy some time in Phoenix, Sedona, and Kaibab National Forest before heading off to the Parks..and then culiminating the tour with a little “dangerous” fun in Las Vegas. Our group is sold out with 45 strong, and all are eager and excited to see what the southwest has to offer. **Send your answers to bill@staging.amazingjourneys.net and if you receive a perfect score, we’ll announce it here on this blog next month. Prize? You want a prize?? If we receive more than 10 entries by November 3rd, we’ll pick a lucky “perfect prize” winner and announce that too!